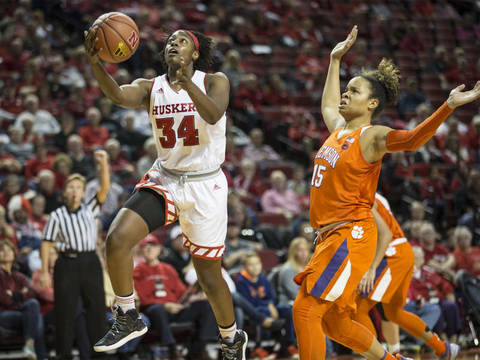 Nebraska led 66-61 with 3:28 left, but the Huskers were held scoreless the rest of the way in a 67-66 loss to Clemson in the women’s basketball Big Ten/ACC Challenge at Pinnacle Bank Arena in Lincoln on Thursday night. The Huskers slipped to 4-3 overall while Clemson improved to 5-2 on the year. In a back-and-forth game, Nebraska trailed 60-54 just 16 seconds into the fourth quarter, before outscoring the Tigers 12-1 over the next 6:16. Freshman Taylor Kissinger capped the Husker surge with a three-pointer to give Nebraska a 64-61lead with 4:38 to play before adding the Big Red’s final bucket on a driving layup with 3:28 left. Kissinger, a 6-1 guard from Minden, Neb., finished with a team-high 17 points, while adding six rebounds, three assists, a block and a steal. The Tigers finished the game on a 6-0 run capped by a jumper from Jaia Alexander with 38 seconds left. Alexander finished the game with just four points, but her long two-pointer was enough to send the Tigers home with a victory. Danielle Edwards started Clemson’s final surge with her only basket of the fourth quarter. Despite being held to just two points in the fourth quarter, Edwards finished with a career-high 33 points in the game. She added five rebounds and four steals while knocking down 5-of-9 threes. She was also 10-for-10 at the free throw line, as the Tigers outscored the Big Red, 22-12, at the stripe on the night. Clemson finished the game 7-of-19 from three-point range after the entering the game just 12-for-62 from long range on the season. The Tigers also went 22-for-25 at the free throw line. Nebraska opened the game with an 8-0 run over the first 4:37, before Edwards answered with Clemson’s first five points. Husker freshman Kate Cain scored five of NU’s first eight points around a three-pointer by Jasmine Cincore to get the Huskers off to a strong start. Cain, a 6-5 center from Middletown, N.Y., finished with 11 points, eight rebounds and a career-high six blocked shots. She and Kissinger were the only Huskers in double figures. Clemson tied the score for the first time at 10 and took their first lead of the game on a bucket with six seconds left in the opening quarter to take a 15-14 lead to the second. Nebraska answered by pushing its lead back to five at 25-20 on a Kissinger three with 6:37 left in the second quarter. The Huskers opened the quarter with back-to-back threes by Hannah Whitish, before getting a two from Nicea Eliely, who added five points for the Big Red after Kissinger’s three to keep a five-point edge at 30-25 with 4:10 left in the first half. Whitish finished with eight points, four rebounds, four assists and three steals, while Eliely pitched in nine points and three boards on the night. But Edwards scored 11 points in the final 3:32 of the half, including four in the final 3.7 seconds at the free throw line to send the Tigers to the half with a 42-38 lead. A foul call on Nebraska and an ensuing technical foul on the Husker bench got Pinnacle Bank Arena fired up and the fans increased the energy in the second half. The Big Red responded, but Edwards stayed hot by scoring Clemson’s first 10 points of the second half to take its biggest lead 56-47 with 2:40 left. However, a Kissinger three cut the margin to six before Cincore was flagrantly fouled on a runout layup with 1:38 left. At that point, the officials tried to regain control of a game that was getting increasingly physical. Emily Wood hit a pair of free throws in place of Cincore at the line, but Kissinger missed a pair of free throws 11 seconds later that could have the cut the margin to two. She did hit the last shot of the quarter with 44 seconds left to send Nebraska to the final quarter down 58-54. Cain and Eliely combined for Nebraska’s first six points of the fourth quarter before Darrien Washington hit one of two free throws with 5:19 left to tie the score at 61, setting up Kissinger’s final five points for the Huskers. Whitish had a layup with five seconds left miss long and Clemson was able to escape with the victory. For the game, Nebraska hit 44.2 percent (23-52) of its shots, including 8-of-17 threes (.471), while connecting on 12-of-18 free throws. Clemson hit just 19-of-53 shots (.358), including 36.8 percent (7-19) of its threes. But Clemson’s 88 percent (22-25) free throw shooting was enough to win. Nebraska outrebounded Clemson, 35-33, but lost the turnover battle, 26-20. The Huskers return to home action on Saturday when they take on Arkansas Pine Bluff. Tip-off against the Lady Lions is set for 2 p.m.